The monthly ArtSmart Roundtable brings together some of the best art-focused travel blogs to post on a common theme. This month we are discussing Color! Color has enchanted artists and art lovers for centuries and we’ve picked some exciting topics; you can find links below for the rest of the group’s posts. I love bright colors, contrasting color, subtle transitions of color, and rich tones, but this month I want to talk about one particularly unique color which is intrinsically tied in my mind to entire collection of objects. I have always been fascinated by Ancient Egyptian blue Faience. The iconic Blue Hippopotamus at the Metropolitan Museum of Art is one of the most well-known blue faience pieces. It was created in approximately 1981–1885 BCE in Middle Egypt. While the technology to make faience was known to the Mesopotamians, Greeks and Romans, it was the ancient Egyptians that produced massive quantities of blue decorative items as grave goods which are now displayed in most museums. These Egyptian blue objects range from a deep cerulean to robins egg color to a green-blue hue. There is a depth and luminosity to this color that comes directly from how the objects were made. But what is blue faience? Faience is actually a glass. When heated to 4500 Fahrenheit, quartz sand, lime and sodium carbonate (aka “soda”) melt and fuse to form a glass. Smelting and kiln technology could support these temperatures. Modern archaeologists have reconstructed these furnaces to understand the process and have found the technology to be very sophisticated. Raw glass ingots were made in tremendous furnaces, chipped and then melted inside a form resulting in these objects. Color could be mixed in when forming the ingot or applied as a powder inside the mold to appear mostly on the object’s surface surface. The colored faience could also be melted around a composition, or ceramic, object. The pigments to produce a blue color would have been readily available. Since bronze is predominantly copper mixed with smaller amounts of tin, lead, nickel, or iron, a common by-product of bronze manufacturing is colorful blue or green copper salts (like CuCO3). Given their potential presence in kiln or furnaces already, this may have unintentionally produced the first color faience. As far as the other ingredients in faience, sodium carbonate, also known as soda or natron, was gathered from dry lake beds in Egypt. It was an integral part of the mummification process because of hygroscopic, or water absorbing, properties. 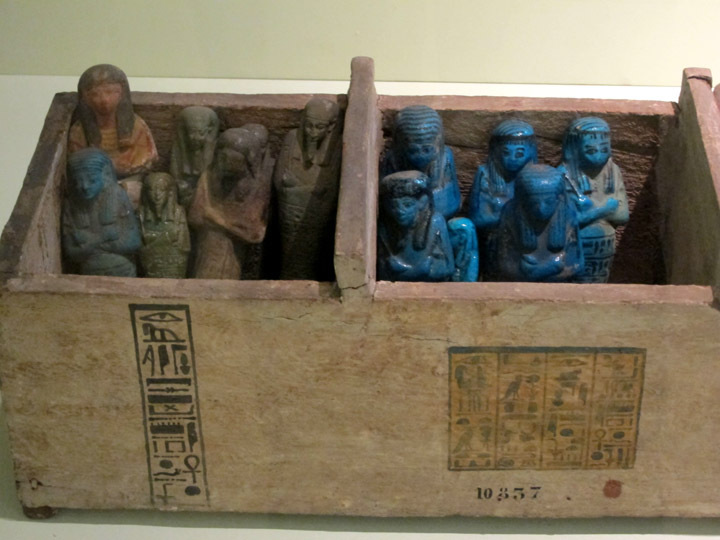 Assortment of Egyptian Ushabti, including some beautiful blue faience ones from the Istanbul Archaeological Museum. 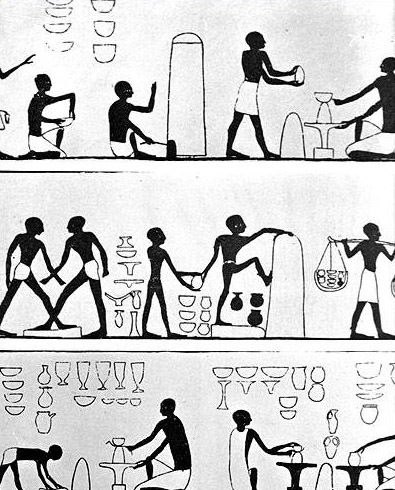 Egyptian funerary practices created a huge market for faience objects. Small mummy-like figurines call ushapti were produced to represent servants that would serve the deceased in the afterlife. Amulets and miniature Gods and Goddesses were included in the mummy’s wrapping for protection. The quality of these objects seems to suggest a massive commercial operation with more expensive and fine-crafted pieces for the rich and simple ones for the poor. If you’re interested in color and artistic materials, I would recommend Bright Earth: Art and the Invention of Color by Philip Ball. I’m a bit of an artist’s materials nerd myself and think this is a great introduction. Erin of A Sense of Place – What Went into Medieval Pigments and Where’d They Come From? And don’t forget to “like” our group on Facebook for art & travel news! Oh my goodness, what a fascinating post, Christina. Loved all the details on technique and would LOVE to come across a box of assorted blue faience Ushabti like the one shown. Gorgeous, gorgeous, gorgeous! Gorgeous! I love the colour it produces. I hope you get your own one day and now so do I. What a treasure and a fascinating post. Love! Emory has a collection of faience pieces in their Ancient Egyptian section, and I always loved how the blue pops around all the warmer toned objects. I always knew it was a glassmaking process, but we never really went into the chemical process. Now I know. Thanks Erin. I’ve always been enchanted by the blue color too. 🙂 It’s amazing to think that it was actually hard to NOT make the faience blue because of all the copper salts in the furnaces left over from bronze making.